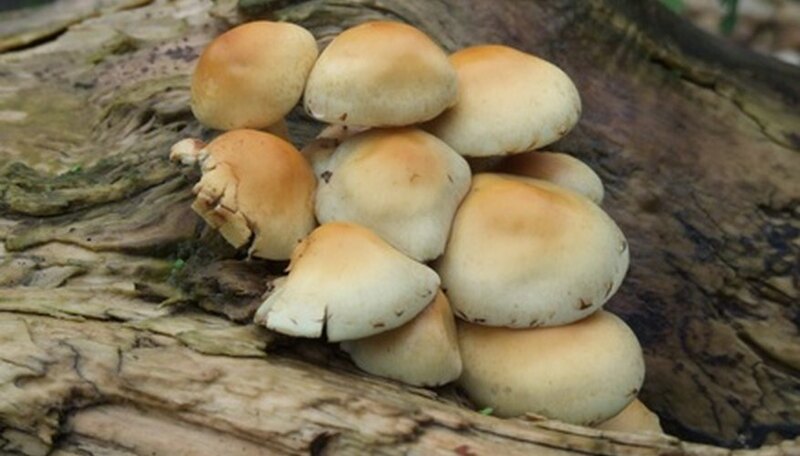 People have used mushrooms for thousands of years for culinary, medicinal and spiritual uses. Cultivating mushrooms is easier than you might think and can be quite rewarding as long as you have the proper supplies and timing. One of the necessary materials you'll need is a substrate, and rye seed is great choice for substrate because of its nutrients. There are some key things to keep in mind when growing your own mushrooms at home--a process known as mycology. Purchase a mushroom spore syringe from a spore bank website. Sterilize the glass jars in a pressure cooker. Let them cool off on a clean towel for at least 10 hours to bring them to room temperature. Layer the rye seed on the bottom of the jars, filling them halfway full. Replace the lids. Create four holes in the top of the lid with the syringe, poking all the way through. Thread some pieces of the polyfil onto the needle and through the holes. This helps block contaminants. Keep the jars in a cool, dry room. Heat the needle on the syringe with a light for about 10 to 15 seconds to sterilize, then soak the cotton ball in rubbing alcohol and swab the needle. Insert the syringe into the jar through the lid holes and inject 100cc of spore liquid into the middle of the rye seed. Repeat this procedure in each of the lid holes. Continue to keep the jars in the cool, dry location, tailoring the temperature to around 87 degrees F. Observe the jars until a white, cobwebby material starts to grow, also called mycelium. Discard any jars that turn green or black. Keep an eye on the jars until mushrooms begin to grow, also known as fruiting. After the mycelium completely covers the rye seed, making it into a solid object, open the jar and slide it into a plastic container that has a layer of perlite on the bottom. Each day, open the container three or four times to fan the mycelium with fresh air. Within a week or so, mushroom pinheads will begin to sprout. Pick them when they are at the desired size, usually when the cap separates from the stem.